Please urge Jacksonville, FL to cancel the Garden Bros. Circus event scheduled for October 13, 2018 at the Jacksonville Equestrian Center! The Garden Bros. Circus will be traveling to the Jacksonville Equestrian Center in Jacksonville FL on October 13th. The circus is traveling with lions, tigers, ponies and camels. The Garden family has a history of criminal charges, animal cruelty citations, lawsuits and customer complaints dating back three decades. A former Garden Bros. employee recently described frequently seeing elephants with blood dripping from behind their ears and reported that the Carson & Barnes trainer who toured with this circus last year would "warm up" the elephants by jabbing them with a bullhook or shocking them with a Taser. The whistleblower also reported that a camel used by Garden Bros. was kicked and punched, and that other camels were whipped. Another whistleblower reported earlier that Zachary Garden, the manager of Garden Bros., habitually beat animals, withheld food from them, and refused to provide injured and dying ones with adequate veterinary care. Venues and localities have already canceled scheduled performances by Garden Bros., refused to issue it permits because of safety concerns, and barred it from performing with wild animals. Ringling Bros. and Barnum & Bailey Circus has been shut down, and other circuses are committing to going completely animal-free—but Garden Bros. Circus is still working with disreputable exhibitors, such as Carson & Barnes Circus, that force animals to perform confusing and often painful tricks. The circus just launched an animal-free unit called The Cirque, and in Canada last year, it toured without wild animals altogether. 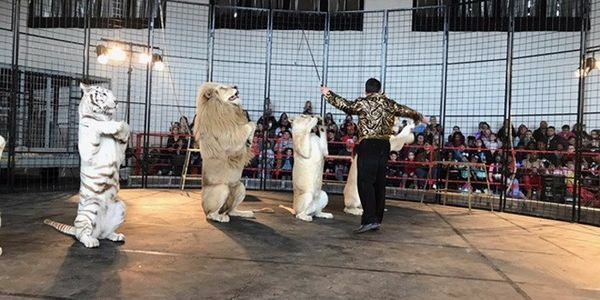 Please sign this petition to tell Jacksonville to cancel the Garden Bros. show until they learn to follow the lead of modern, animal-free circuses and eliminate its animal acts, highlighting its human talent instead.